Home > Crochet > Crochet Tutorials > Felting Knitting & Crochet: What Is Felting? How To Felt? Felting Knitting & Crochet: What Is Felting? How To Felt? I am sure at some point in your crochet or knitting ventures you have heard of the term felting. But what exactly is felting, how is it done, and what do you need to do to get started? My goal for this post is to answer those questions, on felting knitting and crochet and maybe a few more as well. And of course, I wouldn’t just end the post without a really cool project for you to try it! 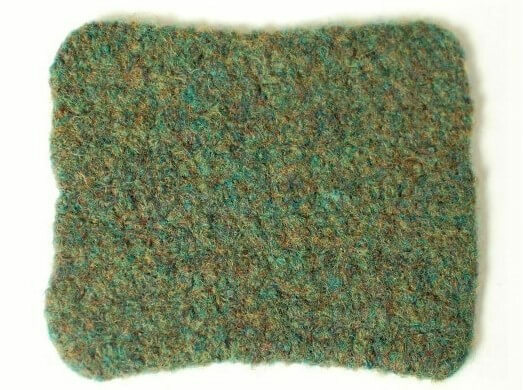 At its simplest definition, felting is the process by which animal fibers condense and bind together to create a dense and durable fabric, like the ‘after’ photo above. This is most commonly done with wool, but can really be done with any protein animal fiber, such as from alpaca, camel, yak, cashmere, mohair, angora, and llama. Although all of these fibers have the properties that allow them to felt, some are more suitable for the purpose than others. Make sure to check your yarn label that the yarn is not a “superwash” wool. “Superwash” wool has actually been treated to prevent felting. There are many different types of felting, including traditional feltmaking, needle felting (you can find my Intro to Needlefelting Tutorial here), nuno felting, cobweb felting, carved felting … but for this series, we are just going to focus on felting knitting and crochet. 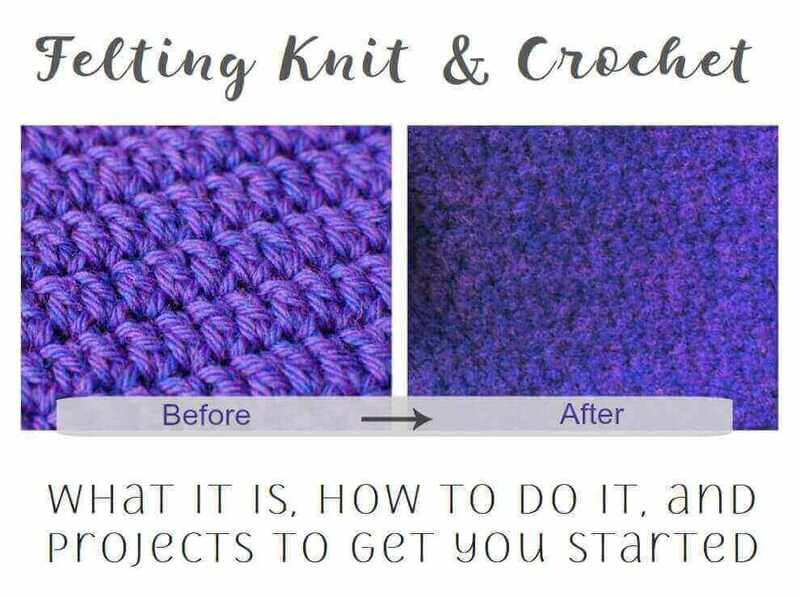 The technical name for doing this with a knit or crocheted piece is actually fulling, but for the sake of simplicity and because it is so widely referred to as felting, I am going to stick with that term in this series. Now that we learned about what felting is and which fibers felt the best, it’s time for the fun part … how to felt! It is important to remember that, since felting is when fibers condense and bind together, this means the size of your project will also shrink in size once felted. Because of this, it is important to have worked up a gauge swatch before beginning a felting project. Below, I will go more into how to do this and how to determine what your project’s pre-felted measurements should be. You can do it by hand or in the washing machine. If the piece isn’t too large, I usually just do it by hand because I feel like I have more control over the piece that way, and I actually think it is kind of fun to watch it transform. But the machine method is definitely faster and involves less “hands on” time. When I felt items by hand, I place a plastic container in the sink and fill it with super hot water and some dish soap. Then I throw my items in and get to work massaging the stitches, scrunchy it up, rubbing it around the container. Sometimes I even put the lid on the container and shake it. You really want to get the fibers agitated so that they start to felt. If the water is too hot, try using a pair of rubber gloves or some kitchen tongs to swish the piece around. After a little while, take the piece out, run it under cold water, and press the water out. Now look at the fabric and see if it is how you like it. Some people might prefer just a slightly felted look, while others might not want to see any stitches at all. If it is not how you like it, throw it back in the bucket and add a little more hot water. Once you get the piece the way you want it, thoroughly rinse it under cold water to make sure all the soap is washed away. Then put the item between two dry towels and roll it up to get as much water as possible out. You can felt your piece in either a top-load or a front-load washer. Both will work just fine, but a disadvantage of a front-load washer is that you can’t stop it mid-cycle to check your progress. For this reason, if using a front-load washer, set it to the shortest cycle option and, if your machine has a no spin cycle option, choose that too. That way, you can check on your piece after the shortest possible time and then decide if you want to put it through again. For both types of machines, you want to choose the hottest water setting and add a little bit of soap. Put your item in a zippered laundry bag or pillowcase to protect your piece from being stretched out of shape and to also protect your machine from the lint fibers. Throw in an old pair of jeans, or a towel, or a pair of tennis shoes … anything that will help agitate the piece. If using a top-load washer, check on your piece every 5 or 10 minutes to see its progress. If the cycle finishes and you are still not happy with it, just run it through again. Once the piece is how you want it, rinse it thoroughly in cold water and roll in layered towels, pressing out as much water as possible. While the object is still slightly damp, shape it to how you like it and set it up to keep that shape as it dries. If you made a hat or a bag, you can roll up some plastic bags to help keep its shape, as in the image below. If it is a flat object, use a few pins to block it. As I mentioned, the type of fiber you use for your project will determine how much your piece will felt. For items where size doesn’t matter too much, like a purse or decorative item, you can just jump in and give it a go. But if you are planning out a project where size matters, such as mittens, slippers, etc., you will want to make up a guage swatch and do a few calculations as I will walk you through next. 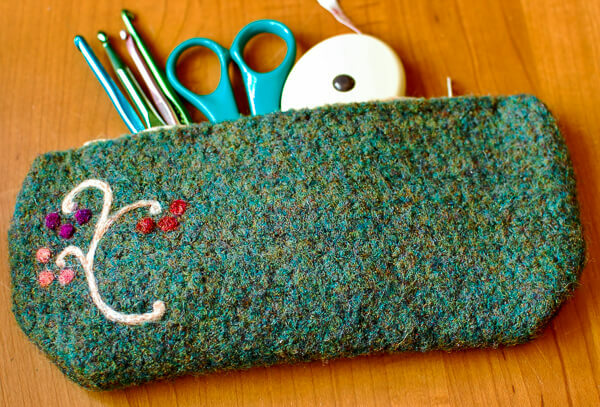 But if you are wanting to jump right in and give it a try, check out my pattern for this fun little felted case. Since felting is when fibers condense and bind together, this means the size of your project will also shrink in size once felted. The amount that an item will shrink can vary drastically depending on the type of yarn used, the hook size, and the type of stitch that was used to work the item. 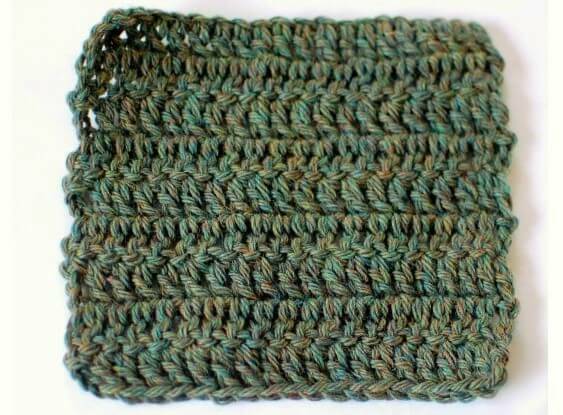 This is why it is important to make up a gauge swatch, so you know exactly how much shrinkage to anticipate. Make up a gauge swatch of about 5 or 6 in. square. Once finished, note the yarn and hook or needle size you used, how many stitches are in each row, how many rows there are in all, and the exact measurements of the swatch. After recording this information, felt the piece according to one of the methods described above. Record your measurements again after felting. So, in other words, we need to expect about a 17% decrease in width. So, we need to expect a 25% decrease in length. Now when I am planning out my project, I should plan to make it 17% wider and 25% longer than I want the finished piece to be. That way, after felting, the piece should come out just the size I want. That’s it. I would love to see how you made out with your felting projects. Tag them on Instagram @petalstopicots so I can see. Let me know if you have any questions or if you found this tutorial helpful in the comments below. Previous Post: « Crochet Heart Sachet Pattern … Valentine Gift Idea! Foccacia, ciabatta, en tout cas j'aime "ta boulange" !Ca sent bon jusqu'ici !Heureusement pour moi une trÃ¨s bonne boulangerie de Bayeux fait la ciabatta Ã merveille mais il se peut que j'essaie un jour….Merci pour les liens !Bonne soirÃ©e ! Great info, Kara! So cool that this is going to be a series! Can’t wait to see what’s next Thanks for sharing at Hookin On Hump Day! Thanks for the info, I have to learn more about this! Looking forward to this series….I have always wondered about felting. This is a new concept to me as well. Looking forward to learning more! I’m VERY excited about this because I have wanted to learn how to felt! 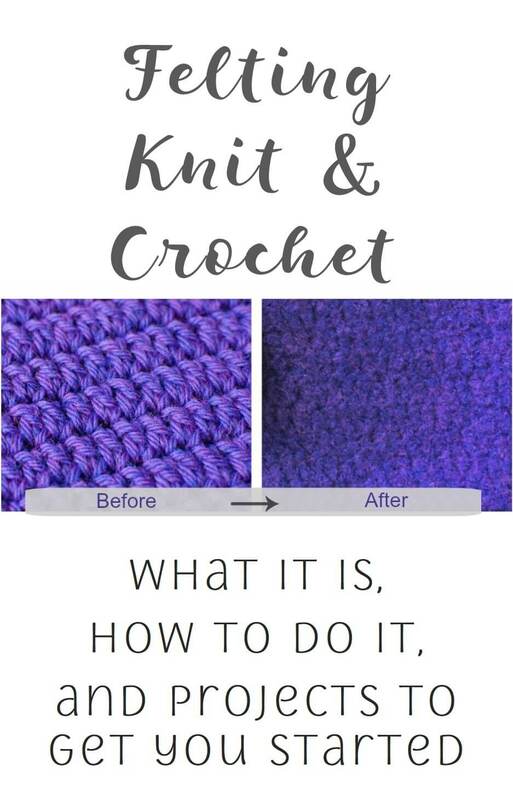 I’ve crocheted for over 40 years – eeeeks, I’m OLD – & ALWAYS love learning new stitches, patterns, techniques. I also LOVE your blog! I look forward to reading it each day. If I am gone & have to miss any posts, I read them ALL when I return! THANK YOU FOR ALL YOU TEACH US! I have heard of felting but had no idea what it was. This is so interesting. Can’t wait to see the rest!